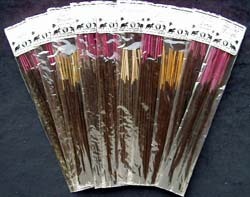 Due to popular demand for our Incense from India product and your requests to try different scents, we have come up with this 10 pack sampler pack that includes our best champas! If you love Nag Champa, this sampler is for you: Ambrosia 8g, Golden Champa 6g, Honey Dust 5g, Shanthi Nag Champa 10g, Maharajah 5g, Flora 10g, Silver Temple 6g, Meditation 7g, Tropical Sun 8g and Seduction 6g. Each pack is individually wrapped to preserve it's scent, freshness and identity.